Couples who love the magical world of Disney may want to consider wearing wedding rings based on the classic Mickey Mouse design. These rings are stunning, and they'd make a lovely addition to any couple's happily ever after story. The Disney Store features the Disney Dream Collection Rings. These stunning rings are available in 14K and 18K white, yellow and rose gold. All diamonds used in the Disney rings are guaranteed to be no less than SI-1 in quality and G-H in color. The Disney Store offers free shipping on orders over $75. Keep in mind that the site does not offer express shipping options, so allow 20 days for most orders. The following designs are included in the Dream Collection. The Diamond Mickey Mouse Bypass Ring is available in your choice of 14K or 18K gold. The 18K gold version is priced at $1540 and the 14K is $1200. 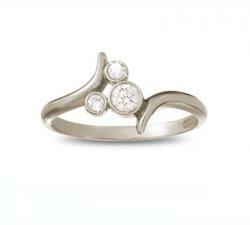 This ring features three diamonds set in the shape of the classic Mickey Mouse outline. It comes in sizes 4 to 8. The Icon Ring is a stunning design available in both 14K and 18K gold. The price for this ring ranges from $3950 to $4325 depending on the metal. It features a center of three diamonds in the shape of Mickey and a band of beveled set diamonds. It comes in sizes 4 to 8. The Icon Ring is also available in a version for men. This 18K white gold version is available for $4,325 and features a single center diamond with gold accents in the shape of Mickey Mouse. The band of the ring has smaller Mickey designs crafted from gold. It comes in sizes 9 to 12 and is ideal to pair with the woman's ring for a wedding set. The Band of Gold Ring is only available in 14K yellow or white gold. It is priced at $1125 and is ideal to wear alone or with a diamond engagement ring. This ring features three bands of gold and three center diamonds set in the shape of Mickey Mouse. It comes in sizes 4 to 9. If you want a ring fit for a Disney princess, consider consulting a local jeweler who can help you find a suitable design. There are also sites online where you can design the ring of your dreams. Sites such as Gemvara incorporate vibrant stones and diamonds to create unique and elegant designs, and you could use stones in colors to match the Disney princess you wish to model your ring after. For example, blue stones such as blue topaz, aquamarine and diamonds work well for a Cinderella ring, or you might choose yellow, red and blue stones such as sapphires and rubies to represent Belle from Beauty and the Beast. Another option is to engrave a magical saying from your favorite Disney movie inside of the ring. For example, "Love is a song that never ends..." from Bambi would make a lovely engraving. You might also like "So this is love..." from Cinderella. Couples who dream of fairy tale weddings will likely find Disney wedding rings perfect in both design and price range. These rings make a wonderful complement to a Disney-themed wedding, and they may even become family heirlooms for future generations.